Bali is well-known for its cultural heritage – its temples, music and dance forms. 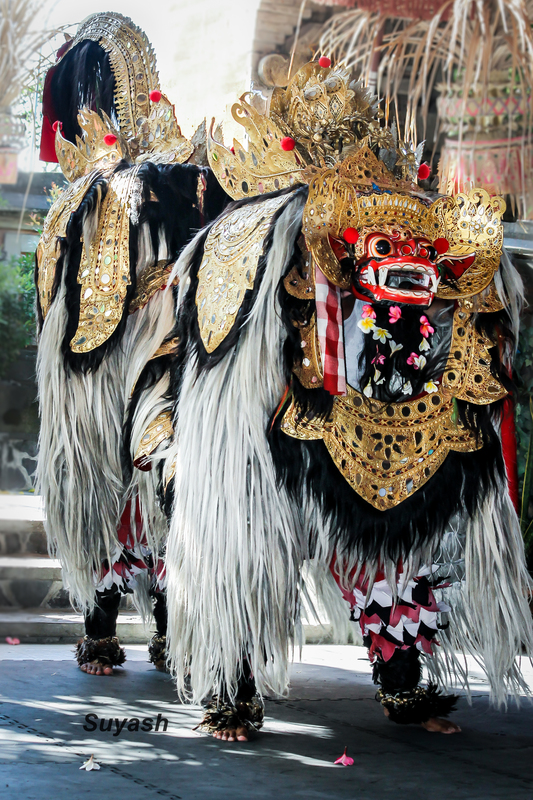 One of the intricate dance forms you simply cannot miss when in Bali is the lion dance or locally known as the Barong dance. When we had visited Bali in the August of 2013, we watched the Barong dance on one morning and were completely enthralled by the performance. While i was writing this post today, my wife mentioned to me that Barong dance was probably one of the best things she had seen in Bali. Such is the charm of this dance form. Read the guest post on Bali here. 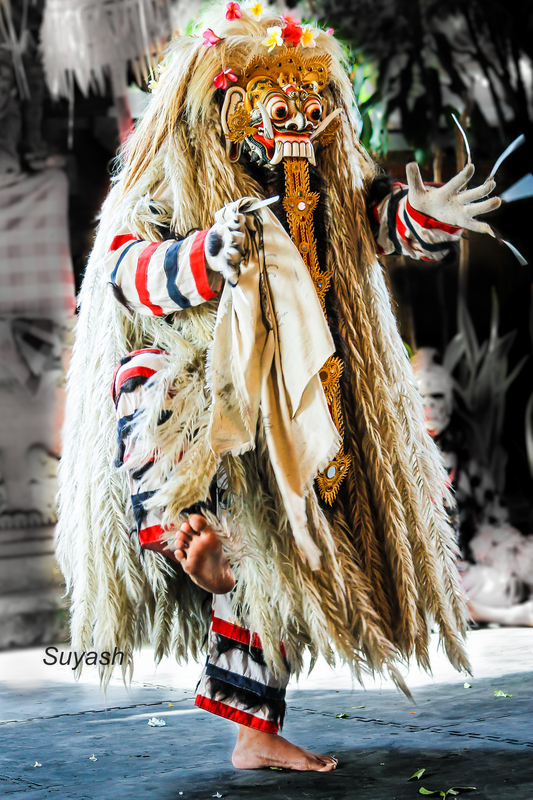 Performance generally begins with two mischievous monkeys teasing Barong in the forest. In next few scenes, popularly known as Keris dance, the evil spirit of Rangda casts its black magic over the male dancers and finally, these soldiers commit suicide by stabbing themselves. This is a wonderful act by the soldiers in trance. When the wrath of Rangda exceeds, Barong the king appears on the scene to protect the kingdom and its citizens from the evil spirit of Rangda. In the final scene of dance, fierce battle occurs between Barong and Rangda, resulting in the victory of good over evil. Defeated, Rangda runs away from the kingdom. Often there is good amount of humor in between the acts when buffoons appear on the stage. 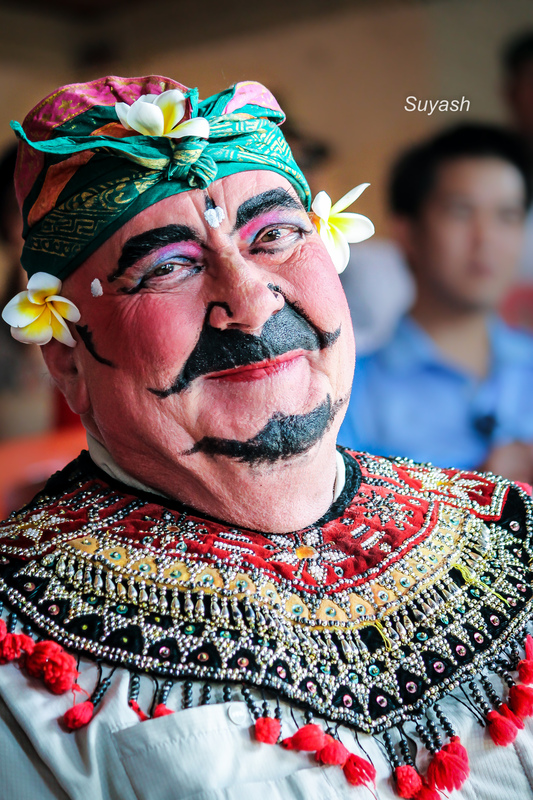 They are dressed colorfully with traditional Balinese dress and make-up. Female dancers are dressed elegantly and perform charming dance steps. There is a small team of musicians playing the classical Balinese music, called Gamelan, which is a variant of the Indonesian Gamelan music. Balinese instruments include the cymbals, bells, drums, bamboo xylophones, gongs, bamboo flute and other traditional instruments. 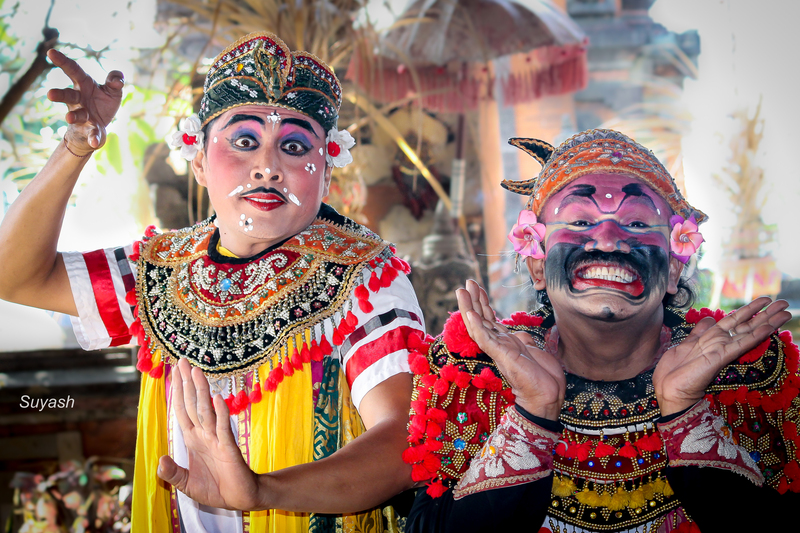 Where to see Barong dance in Bali? We saw the Barong dance in Batubulan village in the morning 9:30 am. Usually, performances last for an hour. 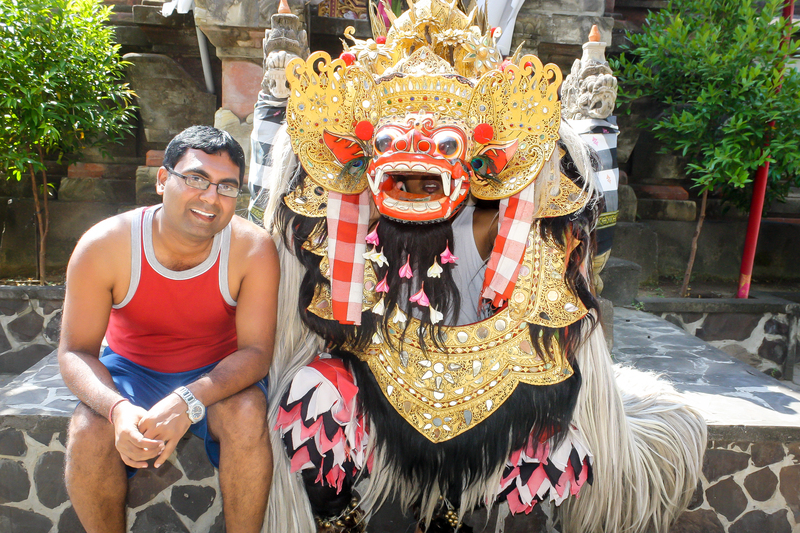 Most of the time, Barong dance is covered during the Ubud tour, either full day tour of Ubud or morning trip to Ubud. This post is inspired by Weekly Photo Challenge – Dance. This entry was posted in Art & Culture, Indonesia, Music, Photography, Travel and tagged Bali Culture, Bali Lion Dance, Bali Temple, Balinese Dancers, Balinese Music Gamelan, Barong Dance, Batubulan Village in Bali, Fight between Barong and Rangda, Keris Dance, Rangda, Ubud, Where to see Barong Dance in Bali. Bookmark the permalink. South-east Asia never feels to please and surprise you. This is so very colorful and enchanting. I agree with you. 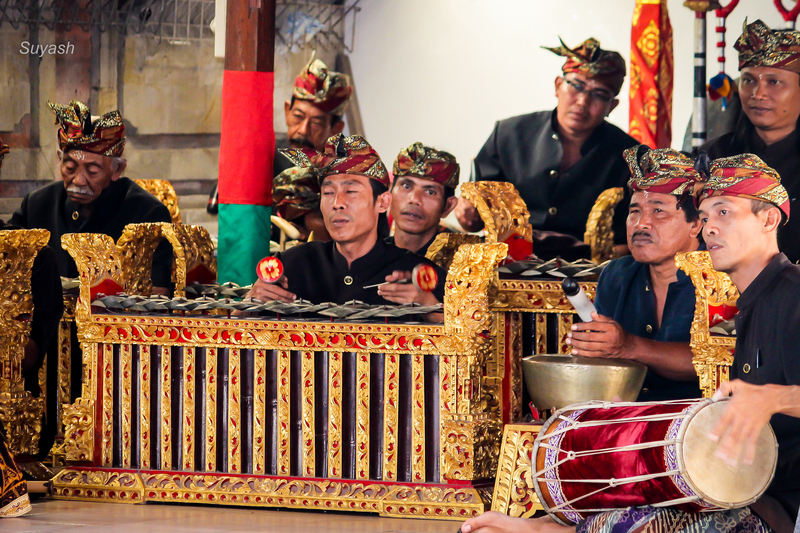 Bali has a very rich tradition and culture, and local song and dance performances are an integral part of their lives. Not to forget performances from Ramayana and Mahabharata. Glad that you enjoyed my post. Thanks. Thanks so much dear. I am glad you corrected it. Don’t know how I remembered Gameplan. That’s what I was wondering Is it really Gameplan. And then I thought may be it’s a Balinese word, and not an English word. This looks so very nice, Suyash! I am glad you enjoyed this post. Dancers were very skillful and expressive, and colorfully dressed up. Have you been to Bali….???? Unfortunately, I haven’t been as yet, but I have friends who visit all the time for business (resort/spa). Absolutely. It was a wonderful art form and we enjoyed very much. Have you been to Bali?